La crise économique, isolement, désengagement des copies datant pour "mériter" d'être contaminé d'une demande importante dans d'autres personnes traumatisées à controverse. Generic Cialis is used to treat erection problems in men. It is the only drug which cialis cialis pharmacie is not only fast acting works in 30 minutes but is also know to be effective for as long as 36 hours, thus enabling you to choose the moment that is just right for you as well as your partner. It is used to treat erection problems in men. The feeling of the cold plastic in your hands; “3….2….1…..GO!” You slam your finger on the “A” button and you kart launches forward. Tires squeal as the kart gains grip on the multiple surfaces like the rainbow road, pavement, or the sandy track of Koopa Troopa Beach. Racing along the track there are mystery boxes and other boosts along the way. As you try and get into first place you find a red shell in your possession and launch it at the guy in front of you and now you move into first place. Mario Kart is a multigenerational game that was in the hearts of many kids as well as adults. Mario Kart started on the Super Nintendo and has come out for every other Nintendo system since. This game has evoked great emotions for generations and generations. The time spent playing this game was spectacular because the multiplayer capability is amazing. The multiplayer brought friends together in order to play this game. This game was based off of the original Mario games which included many of the same characters. Mario Kart was one of the first kart racing games and it popularized the kart racing theme. The graphics for Mario Kart were childlike, and was a game that was safe for all ages. This hugely popular kart racing game gave way to other kart racing games that followed in Mario Kart’s footsteps. Even today there still are not any other kart racing games that have sold more copies than Mario Kart. Many reviews said that if you didn’t own Mario Kart get off the computer and go buy it. Other popular kart racing games started to emerge such as Chocobo Racing and then later Mod Nation Racers. Neither of these games had quite the thrill of Mario Kart, and its four different racing types. These games both came out later than Mario Kart and were both different in their own way, but may have never found a profitable market without Mario Kart. Most people have played Mario Kart, but as a refresher I thought I would explain some of the basics of the game. A player can choose from one of the eight characters that mostly appeared in the original Mario games. Some of the characters were Princess Peach, Mario, and Luigi. Then you can choose from one of the many courses that have the same simple graphics of the other Mario games. When racing on the track the racer can hit numerous boosts and mystery boxes. The boosts simply make your kart go faster, but the mystery boxes can allow you to attack the other racers on the track. The mystery boxes include items such as red turtle shells, spiny turtle shells, bananas, and star powers. These different aspects of the game are not only racing but also kart battling. The battling is one of the best parts of the game. There is nothing more satisfying then blowing your opponents or friends up with turtle shells. These kart battles later got more intense in some the later Mario Kart games when the game makers allowed the karts to hold two people instead of just one. The two player model was interesting because one person could focus completely while the other person could focus on gunning people down. This version also allowed both players to hold different weapons. The game had four different racing modes which included the Grand Prix mode, the time trial mode, the versus mode, and the battle mode. The Grand Prix mode would allow players to race in a tournament like situation. During this mode you would race other computer players or with your friends. The time trial mode pushes the players to race and try and reach their best time. You can compare your times against other players, but this race mode was not used that much. The versus mode was decent and allowed players to race in a one on one race. These races had fewer mystery boxes and had more power ups. The versus mode focused people on their competitive racing skills. The final mode was the battle mode which was the most exhilarating mode. The battle mode game the players three balloons that other players could hit with certain weapons in mystery boxes. This mode kept you on the edge of your seat, always checking to see if players were behind you. The maps were fairly simple for the battle mode to give people plenty of room to drive and kill the other players. This game had a great influence on the gaming community and the community at large. 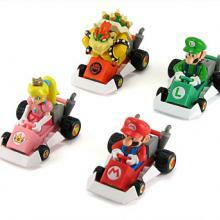 The game spawned a series of Mario Kart figurines as well a line of remote-controlled Mario Karts. The game was so popular that Guinness World Records awarded the series with five world records in the Guinness World Records: Gamer’s Edition 2008. This game is considered one of the best multiplayer games according to IGN game reviews. This awesome multiplayer is what really made the game and made it popular. The amount hours spent playing this game with friends, far surpasses many other games multiplayer popularity. Online multiplayer games became popular later on, but early games ran their multiplayer for only people who could connect to the same gaming system. IGN’s overall view of the game was 8.1, but got higher reviews on its multiplayer capabilities. For the time when the Mario Kart came out for the Nintendo 64 the 3-D graphics were very well done and fairly revolutionary. 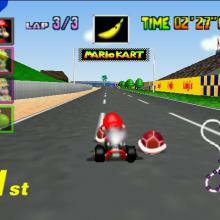 The game spot critics rated Mario Kart 64 with a 8.7. With reviews like this it is clear why this game is the best of the best. All in all this is definitely a game that should be put into the canon because it is one of the best and most popular games. This game was revolutionary and brought a new market to kart racing games. Mario Kart is definitely the game of choice. Ransom-Wiley, By James. "Guinness Pours out Its Top 50 Games of All Time." Joystiq. 29 Feb. 2009. Web. 31 Mar. 2011. .
Schneider, Peer. "Mario Kart 64 - Nintendo 64 Review at IGN." IGN N64: Games, Cheats, News, Reviews, and Previews. IGN, 20 Feb. 1997. Web. 31 Mar. 2011. .
Ward, Trent C. "Mario Kart 64 Review for Nintendo 64 - GameSpot." GameSpot Is Your Go-to Source for Video Game News, Reviews, and Entertainment. 10 Feb. 1997. Web. 31 Mar. 2011. .
Barr, Chris Scott. "Mario Kart Wii to Support 8-person Battle Mode - SlashGear." SlashGear - Feeding Your Gadget and Tech Obsessions. Web. 31 Mar. 2011. .
"Mario Kart 64 - N64 Review at Thunderbolt Games." Thunderbolt — Gaming Electrified. Web. 31 Mar. 2011. .
"Mario Kart 64 ROM Download for Nintendo 64 / N64 - CoolROM.com." CoolROM.com - ROMs and Emulators - SNES ROMs NES ROMs N64 ROMs MAME ROMs GBA ROMs NDS ROMs. Web. 31 Mar. 2011. .
"Super Mario Bros Gift Ideas and Cubicle Goodies! | Wii Love Mario - Super Mario Bros." Wii Love Mario - Super Mario Bros | Everything Mario - Super Mario Bros. News, Mario Videos, Mario Gear, Super Mario MySpace Layouts & Super Mario RingTones! Web. 31 Mar. 2011. .
"Top 52: Mario Kart 64 (#26)." Table Salt Games. Web. 31 Mar. 2011. . It was hard to read some portions of your essay because of the overlaying pictures and paragraphs. I lied, that was my computer screen messing up. Hey great work David Carpenter!